Barna Ganguli is presently a faculty member in the Centre for Economic Policy and Public Finance (CEPPF) at the Asian Development Research Institute (ADRI), Patna. She has done her Ph.D. in urbanisation and environmental degradation (a case study of Patna). She has been engaged in social science research for nearly a decade and her areas of interest are human development, environment, public finance, rural economics, and regional economics. 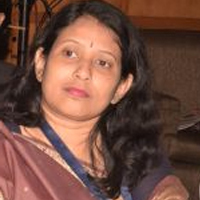 She has the experience working in various evaluation and research projects in Bihar. She has been actively associated with preparation of reports of the Economic Survey of Bihar, State Finance Commission, and of other projects of the state departments. She has also contributed articles on various issues like MNREGA (Mahatma Gandhi National Rural Employment Guarantee Act), climate change, food security, rural tourism, education and health, fertility trends and gender disparity.